“The Grand Tour” – Amazon’s series that continues the tradition of Jeremy Clarkson’s Top Gear is revving up for season two. Several of us at Endurance are huge fans of the series (don’t let the bosses catch us sneaking an episode in during work). Some of us came to the show as fans of Top Gear while others just dove right in when browsing through Amazon. Either way, it is the mix of personality and automotive wonder that keeps us coming back for more. So when the second season was announced, needless to say we were very excited at what was coming. It was going to be bigger and grander…right? Sadly it seems this season will be sticking closer to Clarkson’s home in the UK as opposed to going on an actual grand tour. In fact, production would be a mere 10 miles away from Jeremy Clarkson’s actual home. The GT initials now have double meaning as it’s not just “the Grand Tour.” You see that the show has now moved the primary production to the Great Tew Estate. There’s tons of reasons for this beyond budget limitations. The Grand Tour was a hit for Amazon but it was still one of their most costly projects to date. Another, or perhaps the main reason this was chosen was because the owner of the estate, Nicholas Johnston is a very close friend of former Prime Minister David Cameron (he attended Eton College with the former Prime Minister). Johnston actually negotiated to create Soho Farmhouse on his land. That is a country outpost for the exclusive Soho House private members’ club. So where does Clarkson and the Grand Tour fit into all of this? Well, Business Insider reports that W. Chump and Sons, Clarkson’s production company, secured planning permission in the Great Tew Estate in September. They did so because of Clarkson’s own connections to Johnston. And so that is where Amazon will be sending their Grand Tour resources to. The shooting for Grand Tour season 2 began back in on October 25, 2017 and ended on December 19th 2017. That’s a relatively tighter schedule than the first season. 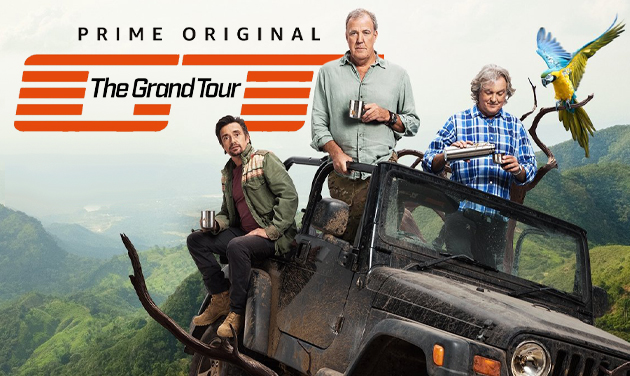 Meanwhile in a particularly ambitious move, Amazon is currently offering Prime members the opportunity to join Grand Tour as part of the live studio audience. One thing we know for sure is that even if the production is smaller and set on a single location, Grand Tour will still have over 350 special guests. Hopefully we’ll get to see all of them beyond footage left on the cutting room floor. Why is the Show Not on a “Grand Tour” Anymore? So the title “The Ground Tour” is a bit of a misnomer. The cast and crew aren’t touring anywhere. Amazon representatives told the press they made the decision to minimize the risk involved in the production. There’s no denying that the hosts Clarkson, Richard Hammond, James May are getting on in age and have been reported to not being able to handle the stress of touring as much as in the past. Hammond himself was in fact injured in a horrific crash while filming earlier this year. Meanwhile Clarkson caught a bad case of pneumonia. Moving to the The Great Tew Estate is also only 43 miles from “The Grand Tour” test track at RAF Wroughton, in Wiltshire.